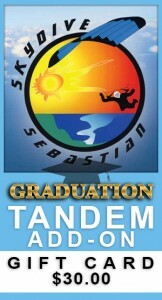 Graduation Add-On **** Receive a gift card to print when your order is completed. You must be 18 years of age and cannot weigh in excess of 230 lbs to do a tandem skydive. Tandem Gift Cards are non-refundable. They are fully transferable.